As the Satellite Proving Ground for Marine, Precipitation, and Hazardous Weather Applications at the NOAA Center for Weather and Climate Prediction (NCWCP) prepares for the winter 2013-2014 demonstrations, it’s always nice when Mother Nature provides some examples, albeit we prefer non-life threatening. The Ocean Prediction Center (OPC), Weather Prediction Center (WPC), NESDIS Satellite Analysis Branch (SAB), and the NHC Tropical Analysis and Forecast Branch (TAFB) will be evaluating the RGB Air Mass product once again and the storm that affected northern Europe this morning is a great case of product utility! SEVIRI RGB Air Mass product (animation – click to start) of the norther Europe strong storm on 10/28/13. The white and yellow circles show highest impact areas. The animation above shows the evolution of a Shapiro-Keyser (1990) type storm that affected the UK, France, Belgium, the Netherlands, Germany, and Denmark with strong winds early this morning. The highest observed wind gust was 99 mph on the Isle of Wight in the English Channel. Wind gusts ranged from 50-90 mph on average with multiple trees down. some structural damage, and at least 3 deaths. So, what in this storm caused the strong winds? The Air Mass product may have a clue. SEVIRI RGB Air Mass product valid at 0700 UTC on 10/28/13 showing the first high impact zone (white circle). SEVIRI water vapor (6.2 um) image valid at 0700 UTC on 10/28/13 with first high impact zone (red circle). At this first time step (0700 UTC on 10/28/13), the white circle on the Air Mass product (first image) shows an intruding area of reddish/pink coloring mixing into the blues and greens to the east. The reddish/pink coloring indicates dry, stratospheric air intruding into the deepening cyclone’s core. The water vapor image (2nd image) shows the drying (blue) and along with the Air Mass product, suggests a strong stratospheric intrusion that would help to transport high moment air (winds aloft) to the surface with deep mixing. This is the approximate time that high wind gusts were affecting southern England and northern France. It is tough to gauge the depth of the stratospheric intrusion in these images. SEVIRI RGB Air Mass product valid at 1200 UTC on 10/28/13 showing second high impact area (yellow circle). SEVIRI water vapor (6.2 um) image valid at 1200 UTC on 10/28/13 showing second high impact area (red circle). Five hours later, the intrusion appears to intensify (based on imagery) with a stronger/deeper reddish/pink coloring developing near and over Denmark on the Air Mass product, while the water vapor image really accents the drying with deep blues and even a bit of brown coloring along the western Denmark coastline. Now, this suggests that the stratospheric drying increased over this time, possibly helping to further mix down high moment air from the mid-troposphere, especially where there is clearing allowing the sun’s heat to aid in deep mixing of the atmosphere. I’m sure this is not going to be the last example as we are just starting our winter storm season. I will be sure to include more updates in the next few months. 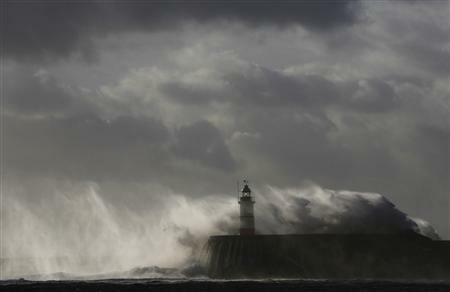 I leave you with this great photo of waves crashing around a lighthouse in South Wales. Thanks for reading!